Young people in their 20s are starting their careers with a negative net worth as a direct result of student loans. With student loan debt burdening a growing number of Americans, a new profile in the Seattle Times recently highlighted one couple's struggle with having a negative net worth to start their careers, despite both having degrees from prestigious universities and reliable work. Today, about 15% of households nationwide have a net worth of zero or less according to Federal Reserve Bank of New York data. Take, for example, Jenni and Sean Gritters. They recently moved to the Seattle area, where Jenni grew up, after earning both bachelor's degrees and master's degrees in Boston. Combined, her and her husband owe about $125,000 on student loans, which has plunged their net worth to negative $93,500. The most expensive loan they had was Sean’s $56,000 loan at 6.49% that he used to get a second bachelor's degree in nursing. The difference-maker for their net worth being in the red, versus the black? Student loans. Without them, the couple's net worth would be in the black by $31,500, which would be above the national median for their age bracket. The debt has weighed on them as a couple. Sean described their student loans posing obstacles to their other financial goals as "scary". He is 28 years old and a nurse in Seattle, earning about $71,000 a year. Jenni is a freelance writer and an editor for various outlets, mainly specializing in health and the outdoors. Her income can vary between $1000 and $12,000 a month. She expects to earn about $100,000 a year before taxes based on her pre-tax payments so far this year. The couple has a really simple balance sheet. They have checking account balances of about $7,500 and savings of about $19,000. They have both taken advantage of retirement plans and, combined, they have about $21,000 in 401(k)s. Jenny has even opened a Roth IRA which has a balance of about $5300. They owe about $15,000 on their car and that represents the only debt they have remaining in addition to their student loans. 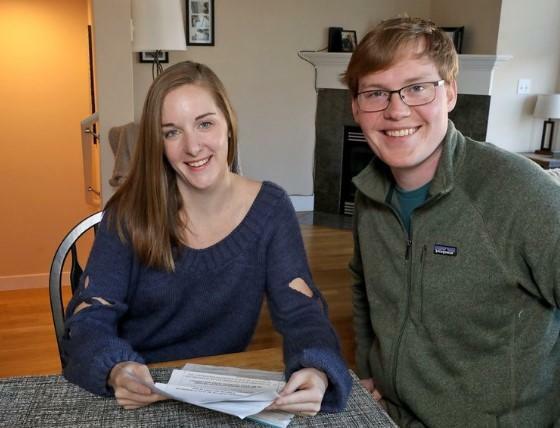 They then applied for free financial advice and, working with the Seattle Times, they started to plan a way to come up with a $50,000 emergency fund while adding more to their savings. The $523 a month they were paying on Sean’s $56,000 loan had them thinking that the debt would "forever be a ball and chain" for them. Since then, they have upped those payments to $1000 a month to try and pay off that loan more aggressively, while still making the minimum payments on the other loans. Sean is now maxing out his employer’s 401(k) match and Jenni is now contributing the maximum she can to her Roth IRA. At the end of every month, the couple now reviews their finances together. They are still waiting to see how these increased contributions effect their monthly cashflow. “It’s a big financial impact,” Sean said about trying to get aggressive about saving. But for now, the young couple feels more empowered and is making progress together. "We're on the same page," Jenni concluded.